An i-adjective is a type of Japanese adjective with a base form ending in -i ~い, like hayai 速い, "fast," kawaii 可愛い, "cute," tanoshii 楽しい, "fun," and so on. In Japanese, such words are called keiyoushi 形容詞, "adjectives," or, more specifically, i-keiyoushi イ形容詞, abbreviated i-kei イ形. The rentaikei 連体形 and shuushikei 終止形 that look identical (kawaii vs. kawaii), but refer to two different things grammatically. The rentaikei is when an adjective modifies something, like a noun, kawaii neko, and the shuushikei is when it's at the end of the sentence, like neko ga kawaii. Also, rentaikei is sometimes called the pre-nominal form or prepositive form. This is because pre-nominal adjectives are adjectives that come before nouns. Pre-nominal adjective, before noun "person," hito 人. Despite coming right before the noun "person," hito 人, nagai is not an attributive adjective here, and therefore isn't a pre-nominal adjective either, because it's technically a predicative adjective inside a clause (mimi ga nagai), and that clause is the adjective for hito. This is the same phrase as above, except interpreted differently. In this case, nagai is indeed a pre-nominal adjective. Most inflections are a combination of one of the forms above plus a suffix or another. = -katta ～かった, the past form. plus tara たら, the kateikei of the ta auxiliary. = -kattara ～かったら, a conditional form. = -kattari かったり, the tari form. = -kereba ～ければ, the ba-form, a conditional form. = kunai くない, negative form. = kunakatta くなかった, past negative form. plus naru なる, the verb "to become,"
= "will become adjective," in the future. = -karou ～かろう, the volitional form. As I'm no linguist, I can't tell for sure where an inflection really ends and where something else begins. As you are probably no linguist either, you probably don't care about it. What's important is you glue stuff to the adjective's stem and then it means stuff. This word, "stem," means "root," in case English isn't your native language. All inflections of an adjective branch away from this root. 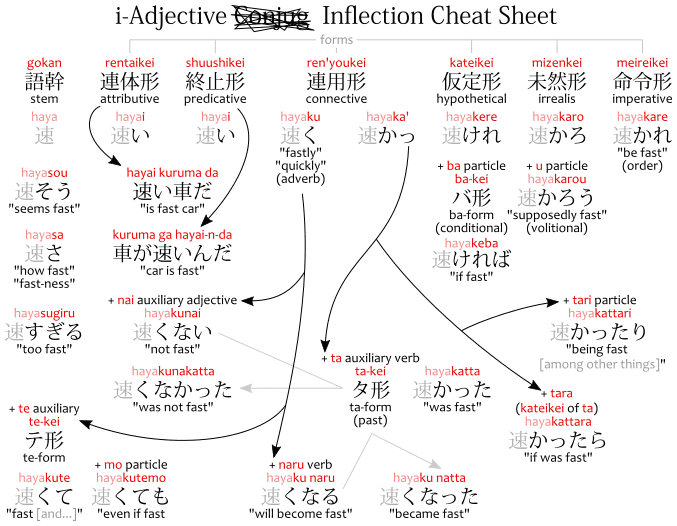 For reference, a cheat-sheet containing the inflections of i-adjectives in Japanese. Although most words that end in i い are i-adjectives, not all words that end with i are i-adjectives. For example, kirei きれい, "pretty," ends in i but is a na-adjective instead. Usually, you can tell i-adjectives apart from words that just end with i because you can't inflect kanji, only kana. For example, kirei written with kanji is kirei 綺麗. 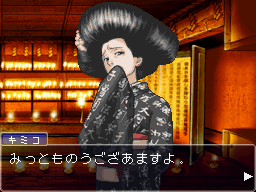 There's no i い okurigana there; it can't be inflected; it's not an i-adjective. Note that sometimes a word has an i い ending written in okurigana and still isn't a an i-adjective. An adjective that modifies a noun this way is called an attributive adjective. In Japanese, the form is called rentaikei 連体形. Inflections of i-adjectives sometimes need to be translated as adjectival clauses instead of simple adjectives in order to make sense in English. . The summer that was hot. The winter that was not cold. The winter was not cold. Adjectives used this way are called predicative adjectives, since they're part of the predicate for a grammatical subject. In Japanese, the form is called shuushikei 終止形. There's no difference between the meaning of the phrases above. There's a difference in nuance, because desu is a polite copula, but that's all. Likewise, all of the phrases below mean "cats are cute." Note that, although you can say neko ga kawaii desu, you can't say neko ga kawaii da, as that's grammatically wrong. You must say neko ga kawaii-n-da or neko ga kawaii no da. This common construction, -i-n-da ～いんだ can be divided into three parts: an i-adjective, the n ん particle, which's the contraction of the no の particle, and the da だ copula. You might be asking yourself why's it wrong to say -i-da instead of -i-n-da or -i-no-da, but it's alright to say -i-desu instead of -i-n-desu or -i-no-desu. I'm saying: cats. ARE. Cute. When using shuushikei adjectives in past tense with copula, the copula must be in non-past tense. That is, when you have an adjective in past -katta, you use da or desu, not datta or deshita. The English copula would be is, are, was, were, so the way it works in Japanese is different from how it works in English. In English we would say it was (past) fun (present). Mostly because there's no past tense of "fun." If there were, like funned, Japanese would be like: "it is funned," tanoshikatta desu, to say "it was fun." (The movie.) It was fun. Better not to risk and stick with tanoshikatta desu. In its adverbial form, an i-adjective can modify whatever verb comes right after it, just like any other adverb. To run quickly. To run fast. To be able to sell expensively. To be able to sell for much money. To be able to sell for a lot. I.e. : the story will take a while to tell. "It's a long story..." Etc. The te-form of i-adjectives, or te-kei テ形 , is the ren'youkei 連用形 form, the one ending in -ku ～く, plus, literally, a -te ～て. In other words, the te-form of i-adjectives is the form that ends in ~kute ～くて. This te-form is used to connect one adjective to another, which essentially means one thing is two or more adjectives at once. [She's a] kind, beautiful, cute, cool, good person. Like in English, stringing so many adjectives like that sounds weird. So most of the time you'll only ever see one -kute ～くて, two adjectives, no more no less. Something is X and Y. And it's Y because it's so X. The sea is blue and beautiful. And it's beautiful because it's so blue. That is, blue is a beautiful color, so, by being blue, the sea is beautiful. In most cases there's really only one order for the adjectives connected by the te-form. That's because the opposite order wouldn't make sense. For example, above I might've implied the sea is beautiful because it's blue. If I said the opposite, umi ga utsukushite aoi, it would imply that the sea is blue because it's so beautiful, which makes less sense than saying it's beautiful because it's so blue. It's fast because it's so expensive. It's expensive because it's so fast. Note that in the example above there's no causal relationship between the two adjectives. Is she pretty because she's kind or kind because she's pretty? Neither seems likely so there's no implication an adjective is the cause of the other and it just means "kind and pretty" or "pretty and kind." The te-form is normally not used to connect two colors together. The country flag is red and blue. The red and blue country flag. The blue sea is beautiful. One gotcha concerning the Japanese language is the use of adjectives such as ooi 多い, "numerous," which vaguely describes the number of something. People are numerous. People are many. My guess is this is because of how plurals work in Japanese: a single noun can be either singular or plural, and since it can be either singular or plural, hito 人 can mean either "(one) person" or "(multiple) people." Obviously, with ooi hito, what we want to say is: "numerous people," "lots of people," but what it sounds like is that we're saying "one numerous person," "one lots-of person," and that makes no sense. Lots of people. Many people. So ooku no hito 多くの人, "numerous people," is syntactically identical to nihon no hito 日本の人, "Japan people," i.e. "people of Japan." It's a noun followed by a no の particle that turns it into a no adjective. Even though it was originally an i-adjective. That's Japanese for ya, it makes no sense. Lots of people died. Many people died. Note that this is only the case in rentaikei, when the adjective comes before a noun, not in shuushikei, when the adjective comes at the end of a sentence or clause. 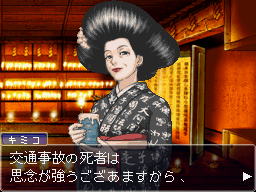 Which means you can have ooi hito if ooi is at the end of a subordinate adjectival clause. Which is basically whatever comes before a noun that describes that noun. A person whose friends are numerous. A person [that has many friends]. Friends are numerous. Friends are many. This form often implies the adjective is intense. That is, seldom we're talking about how little sweetness something has, so, usually, we're talking about how very sweet something is. Weak to the hot-ness of the summer. Weak to the heat of the summer. Weak to how hot the summer is. As you can see above, sometimes the translation becomes quirky, but the concept remains the same. The height of that building. How high that building is. It looks fun. It seems fun. The ba-form of i-adjectives, ba-kei バ形, is the kateikei 仮定形 form -kere ～けれ plus the ba ば particle, so, -kereba ～ければ. This form is sometimes called the "conditional form," because it forms conditions. Basically "if X, then..." where X is the adjective. If [you're] cute, anything can be forgiven. Anything is allowed if you're cute. If [it's] alright [with you,] please use [it]. The tara-form of i-adjectives is the ren'youkei 連用形 form -ka' ～かっ plus the tara たら particle, so, -kattara ～かったら. So, technically, it'd be the hypothetical past form. In practice, it's similar to -kereba, meaning "if X, then," where X is the adjective. If you want something, steal it. If you want this one thing specifically, steal it. The tari たり form of i-adjectives is the ren'youkei 連用形 form -ka' ～かっ plus the tari たり particle, so, -kattari ～かったり. The volitional form of i-adjectives is the mizenkei 未然形 form -karo ～かろ plus the u う particle, so, -karou ～かろう. So the volitional form means "I guess it's X" or "I hope it's X" or, as a wish, "let it be X!!!" Where X is an adjective. Note that this -karou form is rather uncommon and archaic, and appears more set phrases. Usually, people prefer to use darou だろう or deshou でしょう, the volitional forms of the copula, rather than the volitional form of the adjective itself. Another rather situation it's used are in phrases like something-rou ga something-rou ga. Which means "be one thing or another," and is usually used when the two things are antonyms and the speak means "it doesn't matter if it's this or that!" Whether it's hot or cold I don't care! Be it hot or cold I don't care! I don't care if it's hot or cold! This form isn't limited to adjectives. It can be mixed with verbs too. Having money or not having money doesn't matter! It doesn't matter if you have money or not! Whether it's fun or boring. Whether you kill him or let him live. The imperative form of i-adjectives, meireikei 命令形, would be -kare ～かれ. Note that this form is uncommon and archaic. Like -karou, it's used in manga and anime by kings, anachronistic characters, and in period settings. In modern Japanese, you'd link the adjective to a verb instead to form an imperative rather than using the imperative form of the adjective itself. The term "imperative" refers to giving orders. For example, okiru 起きる is a verb for "to wake up." Its imperative conjugation, okirou 起きろう, would be ordering someone to "wake up!!! !1"
The "auxiliary adjectives," hojo keiyoushi 補助形容詞, are i-adjectives that can be attached to verbs or other adjectives. The most common of them is nai ない, which makes stuff negative. There's also tai たい, makes stuff desiderative, which means "want to" more or less. To not want to work. Since auxiliary adjectives are i-adjectives also follow i-adjectives rules. In particular, the ones about copula. By the way, this is pretty useless information, but technically Japanese allows you to add a negative auxiliary adjective to a negative auxiliary adjective. That's right: double negative. Obviously the above is completely pointless if you're trying to... well, say something meaningful. But it can sometimes show up sometimes as a joke. This is one of the least important things concerning i-adjectives: sometimes their inflections are pronounced in a different way. The -ku ～く inflection, in some parts of Japan, in some periods of Japan, gets pronounced differently when it comes before the verbs gozaimasu ございます and zonjimasu 存じます. In manga and anime, characters which speak using these variations are implied to be either from a different region or time. 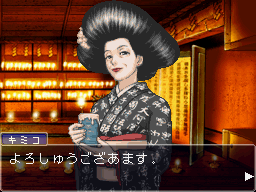 That is, they're probably from the Kansai 関西 region, anachronistic, time-travelling, or just very old. Note that since they're using a different pronunciation of one word, it's possible they're pronouncing other words differently too. Or even speaking in a different way, choosing different words altogether. The ren'youkei 連用形 form of i-adjectives that end in -tai ～たい would normally inflect them into -taku ～たく. When they come before a verb like gozaimasu, however, sometimes this -taku changes to be pronounced as -tou ~とう instead. An adjective: auspicious. That should be celebrated. The same thing happens with arigatai ありがたい turning into arigatou gozaimasu ありがとうございます and ohayai お早い turning into ohayou gozaimasu おはようございます. The above are all set phrases, so I supposed this only really helps understanding where they come from. Expression said after meeting someone whom you'll work with, or be in care of. You can find a list of i-adjectives searching the #adj-i tag on jisho.org.